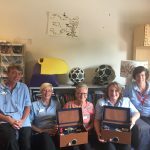 We have been piloting Music Memory Boxes all over Bristol for a good while now, and although we are only part way through, we have already learnt so much. This project has given us an opportunity to spend a lot of time talking to the real experts in dementia care; care home residents, care home staff and families all living with dementia day to day. We have had tonnes of conversations about the unique power of music and the importance of life story work (spending time focusing on people’s histories; their passions, friends, family, homes and holidays). During a group session at a Amerind Grove a few weeks ago, we were using a box that had only just been set up with a few songs. We triggered one of the songs and straight away it called up a string of memories. P told us about how she used to teach children at a Sunday school. At the end of every lesson she would line them up and inspect their pockets to see if they had pinched her pen. She had a pen that meant a lot to her because it was the last gift she had been given by someone close to her before they had passed away. P’s son had never heard this before, he didn’t even know that she ever taught, and this was all within minutes of using the box for the first time! Before beginning the pilot, we spoke about the ideal benefits of the box. The idea that someone would find out something new about their loved one or the person they work with was something that we had hoped for, but not banked on. What is so exciting to us now is that P and her son’s experience wasn’t a one off. During this pilot, someone learnt how their parents met for the first time, another heard the full story of their father’s first experiences of music. Residents and key workers have found out a lot of things they have in common. One pair found out they grew up round the corner from each other, a couple of generations apart. Another pair, having always kept up a friendly rivalry over Rovers/City support, have now found common ground in their shared love for Amy Winehouse! 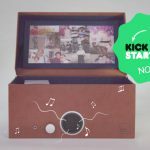 We feel like the boxes have proven themselves as a tool for framing conversations as well as a way for people to access the music they love – sometimes leading to all out karaoke sessions (see picture of Vera below). As well as learning about how the box is used, we are taking great care to note how we can make the finished box better. 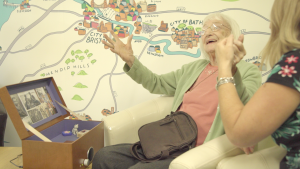 Thanks to families and care homes across Bristol we are gathering really helpful feedback which will help us to come up with the changes we need to make the experience of using the product as practical and enjoyable as possible. We are looking forward to taking everything we have learnt to the design table in order to create the best Music Memory Box we can. Working with new member of the team, Meg Houghton Gilmour, we have been documenting some interactions with the box with Deerhust residents and staff. Meg has started editing a series of short films about the pilot, which we will release in the run up to our Kickstarter launch. Sign up to our newsletter and keep an eye on our Twitter and Facebook to keep updated over the next few months. Am the CEO of a start-up company for Memory Care Center in the U.S. I am an entrepreneur, a Harvard business school alum, RN who has an ICU, especially Neuro ICU experience. Has experience in hospital management as director, clinical nurse manager, and currently as a part-time Nursing Administrative Hospital in Alina Healthcare, the largest healthcare provider in the state of MN. I would be interested to use my memory care as a pilot facility in the US and would be willing to use technology to collaborate. Please feel free to email or call. Annh@syncaremn.com or 612-512-3785. Wonderful ideas to connect with people.